Please find PPS Kanudadaji’s picture from Bhadran. Relations are always dependent upon circumstances which are ever changing. Overcome the circumstances with equanimity and understanding. Please share your day-to-day experiences with us regarding this quote. How do you overcome circumstances with equanimity? What type of understanding is necessary to do this? Stay tuned with for the next live satsang with PPS Kanudadaji!! Birth date– March 27, 1934. Even before meeting Dadaji he was kind, noble and generous in his social or professional living. Many people have received some or other help from him including financial help. Even swami Jaymeshanandji had same experience when he had approached Shri G.A. Shah for joinning his english coaching class as a student of 10 th grade and upon requesting to allow him pay class fees in 4 installments, Shah saheb had readily accepted it without knowing him before. After seeing Dadaji It all flourished with Gnan. 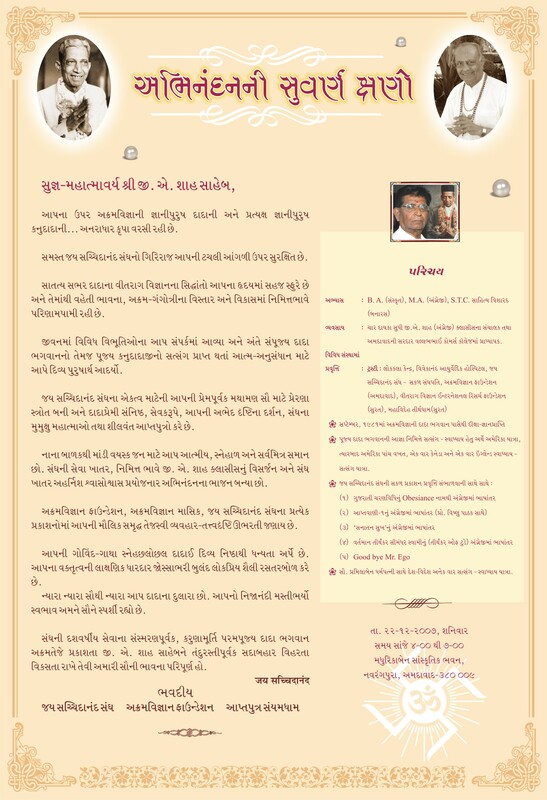 ‘Akram Vignan ‘ (monthly )- began in 1980,July- ‘Akram Vignan’ monthly magazine was started by direct blessings of Dada Bhagwan – wherein Shri Ramesh Bhatt, Shri Radheshyam Sharma and Shri Vishnubhai Pathak Saheb were entrusted responsibility of Akram Publication. Shah saheb joined later on and along with mahtma Sudhirbhai and mahatma Radheshyambhai devotedly and uninterruptedly carried out this task till his last breath. Shri shah saheb was entrusted responsibility as Sakal sanghpati in 1997.So he served over 12 years as sakal sanghpati. He had lot of contributions including English translation of Aptavani 1 and Obeisance book. He was instrumental in translation. Compilation and editing of many sangh publications including invitation cards for various occasions of sangh celebrations or documentray DVD for Jai sachidanand sangh. Shah saheb used to come for darshan of Dadaji from Amdavad to Vadodara even late at night as he used to be busy with his famous ‘G.A. Shah – English classes ‘ and Dadaji used to sit till shah saheb comes even at 10 /10.30 Night. Dadaji in later years ( from 1984) always stayed at Shah saheb’s place when He used to be at Amdavad for satsangs. His house used to remain full with aptaputras and all mahatmas . Shah Saheb always used to tell only one thing ” I don’t know anything else but I would only like to please Dadaji. He only looked for Dada’s ‘Rajipo ‘. And Dadaji also on other occasions have clarified that Gnani’s Rajipo collectively results into Krupa. Rajipo is like cents and Krupa like a dollar. His devotion and service were full , not only by mind, body ,speech but wealth or money too. To be able to serve sangh in a better way he also closed down his booming classes. He always used to say that I am ‘tar vagarno tamborro ‘of Dadaji. Since his discharge egoism was at very low, he was given permission and even asked to do satsangs by Dadaji. Dadaji had not only blessed him but also had entrusted him all future responsibilities about sangh. Shri Vasantbhai was told by dadaji, ” you may ask shah saheb for any relative problem or difficulty of J.S.Sangh . So Shah saheb had to take over as Sakal sanghpati in 1997 . He had such a tender heart and sober personality that he could never hurt anyone, nor speak any harsh word to anyone even if he was asked or required to do so. Infect he accepted all poisons from different people in various forms as adverse comments, complains ,quarrels or hurting words with perfect state of Gnan . He had only one thing at heart, ” Let this Dada’s sangh remain one with love that is to say remain united . At times he used to become sad in relative part seeing some adverse occurring or play of personalities. But he was always seen trying to meet everyone, trying to love all mahatmas and trying to keep all as one . Even when his body strength was on decline in last couple of years, his heart and mind were as enthusiastic and energetic and till end he kept on working for Sangh. Kanudadaji rightly says that he was best example of ‘Laghubahv‘ and ‘Abhed drashti’ for all of us. We all pray Simandhar swami and Dadabhagwan to shower blessings on him such that his link to Simandhar swami remain uninterrupted and his way to liberation remains free of any obstruction. We are also sure that he is at very high position and would be helping this cause of Jagatkalyan from where ever he is . There is external happiness in the ‘Self’ but never in externals. Such natural happiness is that of the ‘True Self’ only. Please share your day-to-day experiences with us regarding this quote. How do you find happiness of the True Self? What is happiness from the True Self? Why is there never happiness in the externals? 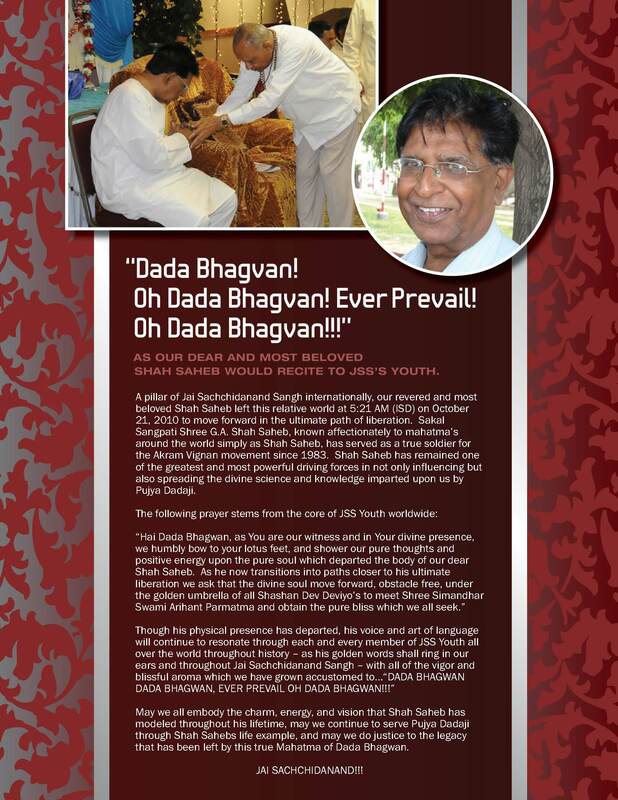 Read about Shri GA Shah Saheb and PPS Kanudadaji’s Blessings for him on the BLOG. Starting November 1st, we would like to also remind you to send your experiences with reference to Shri GA Shah Saheb to akramvignan! With heavy heart we want to convey every mahatma of Jai Sachchidanand Sangh in India and the world over that we have lost our overall President [Sakal Sanghpati] Shri GA Shah Saheb on October 21, 2010. He was suffering from secondary level of jaundice. He was 76. We request and appeal all the mahatmas worldover whosoever had come in contact with Shri GA Shah Saheb and whatever you have learnt from him, please send your experience with him as a greatest tribute to his hard and dedicated work from the day he met Dada Bhagwan in 1983. Please send your experience in one week time!! Once it is realized that there is endless happiness within, the quest for happiness from externals will cease. Please share your day-to-day experiences with us regarding this quote. How do you find happiness within? What is happiness from within? Check out PPS Kanudadaji’s Janmotsav pictures on the blog! Read about the Navratri satsang referencing Aptavani 2. Also, stay tuned with us for the next live satsang with PPS Kanudadaji! !